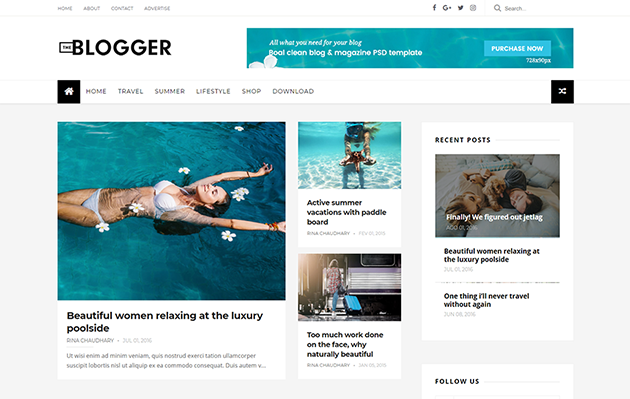 TheBlogger is a created with more innovative, cleverly coded and feature rich magazine theme. It is easy to customize for all kinds of blog, news, newspaper, magazine, publishing or review site needs. Fully Responsive Design Fully SEO Optimized Mobile Friendly Design Support Youtube thumbnail Advance Search Engine Optimization Auto resize thumbnail image Tabbed Menu Well Online Documentation Random posts Recent Comments Threaded Comment Multiple comment system Recent Post By Label Related posts support Ads Ready Auto Author Image Newsletter Subscription Custom Error 404 Page Blogger news templates Compatible with major browsers (IE8+,Mozilla,Chrome,Safari) Professional admin layout, help you easy work with blog layout.